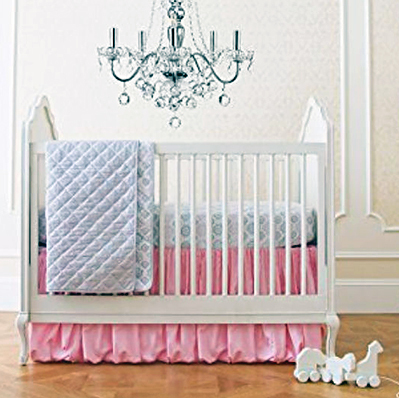 We have some tips to share on ways to decorate a pink and black nursery for a baby girl. Black and pink nursery themes are all the rage and they range from the ultimate with the most formal in elegant, high end (read: expensive) baby bedding sets to playful rooms bubbling with polka dots, stripes and cute girly graphics. There are also pretty pink accessories and DIY wall decorations for your project. 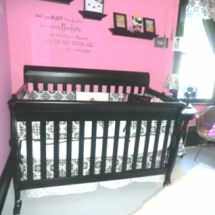 Go here to see many pink and black crib bedding sets that you might consider for your nursery decorating project. At the time of this article this catchy color scheme is very trendy so there is a broad selection of crib bedding sets and pastel and hot pink and black baby items to pick from. 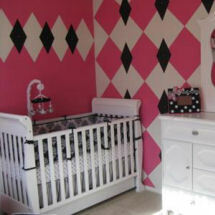 The pink and black color scheme lends itself well to common nursery themes for girls as well as the most modern, "different" and unique themes. A pink and black nursery with painted horizontal stripes on an accent wall can be the perfect contrast for a girly room with a damask baby bedding set. Pink poodle baby bedding sets add just the right touch of "Oooh La La" to a baby girl's nursery room. The crib quilt might include a hodge podge of icons associated with France. 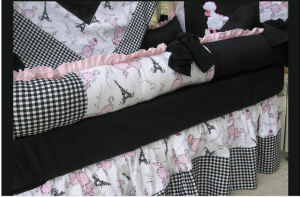 Fabrics featuring French poodles and images of the Eiffel Tower would be the perfect choice. Hello Kitty and Strawberry Shortcake baby bedding sets might form the foundation for a pink and black nursery theme if you are creative. These characters certainly have enough pink in their items to cover that side of things if only you can locate enough black decorations to balance the room. A nursery decorated with pink and black polka dots holds a virtual guarantee of a happy, smiling baby. Current nursery decorating trends have decorators blending dots with any number of patterns with unusual and often breathtaking results. So long as you stay in keeping color wise, you’ll be fine and probably have lots of fun! Ladybugs may be red in nature but in a baby girl's nursery; all bets are off! Pink and black ladybugs are cute as a bug and is a timeless theme that never goes out of style. The shade of pink that you choose ultimately depends on a color match to your inspiration piece. However, the amount of natural light and size of the room should be considered the decision. These considerations can also determine the amount of black accessories to include. Before you leave Unique Baby Gear Ideas please take a peek at our gallery of pictures that contains many pink and black baby nursery ideas that you can add to your project's inspiration board. 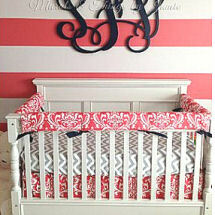 Do you have a great set of baby bedding or a picture of a nursery that you decorated in a pink and black color scheme? Share it!